Just one day after Jason Johnson was identified as the suspect who broke into the Riverside County Animal Services shelter in Jurupa Valley, Calif., the loser has been arrested. Johnson was taken into custody by deputies from the Jurupa Valley sheriff’s station at 1:30 a.m. today, according to a press release, and booked into the Robert Presley Detention Center in Riverside. 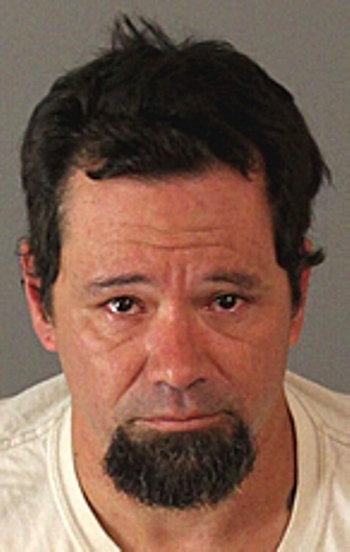 His bail was set at $5,000, the Press Enterprise reports. According to Superior Court records obtained by the Press Enterprise, Johnson has a litany of prior drug-related convictions in Riverside County, including unlawful possession of drug paraphernalia, possession of a controlled substance and being under the influence of a controlled substance. The Press Enterprise reported yesterday that Johnson stole three Pit Bulls who were under quarantine and facing possible euthanasia. He then broke the locks on other cages to try to cover up his motives. Investigators believe Johnson knows the owners of the three Pit Bulls. Shelter staff arrived around 6:30 a.m. Sunday to find seven dogs roaming free. Two dogs — a Chihuahua and a Yorkshire Terrier mix — were dead. “We found blood spatter everywhere,” John Welsh, spokesman for Riverside County Animal Services, told KTLA. Dr. Allan Drusys, Riverside County’s chief veterinarian, is performing necropsies on the two dogs to determine the cause of their deaths. Surveillance footage showed Johnson using bolt cutters to slice through the locks on the cages. Twelve dogs were initially reported missing. Seven were eventually found — but two of them, a German Shepherd and Pit Bull, had been hit by cars and killed. A crime prevention analyst from the sheriff’s department is determining how to improve security at this and other animal shelters in Riverside County. Investigators believe Johnson may have climbed over a fence and broken the kennel locks without setting off an alarm. Two non-profit organizations that work with the shelter — Animal Solutions Konnections (ASK) and Shelter Transport Animal Rescue Team (START) — offered a $35,000 reward to anyone with information that led to a conviction. The Humane Society of the United States announced yesterday it was also offering a $5,000 reward. “The Riverside County Sheriff’s Department would like to thank the public and media for their assistance with this investigation that ultimately led to the apprehension of Jason Johnson,” the department said today.